If you’re anything like me, then almost nothing will get in the way of you, your bed, and some nice z’s. The only problem is that college and school in general tend to get in the way of that. I have to say that coming into college, sleeping through a class was a serious concern of mine, and I decided it was a good idea to invest in “Clocky”. You can check it out below. Though Clocky may not have been the best idea for when I have a roommate, it is very loud and often works. There are many other options so make sure to check them all out! To read some more tips for waking up click for the full length article on Health Online! Addicted to your snooze button? Here’s your cure. 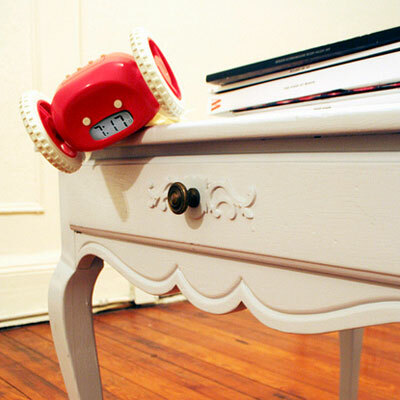 This cute, wheeled timekeeper ($39, nandahome.com) rolls and leaps, from up to 3 feet, off your nightstand after one snooze. What’s worse, it does so while beeping random patterns and hides until you hunt it down. It’s safe to say you won’t be catching any z’s catching this clock. The last thing you may want to do is pump iron before breakfast. 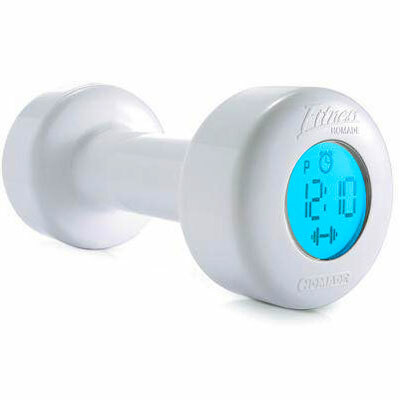 That’s too bad, if you set this 1.5-pound dumbbell clock ($35, gadgetsandgear.com). It will shut off only after you’ve done 30 bicep curls. What’s more, it has internal motion censors, too—so you can’t cheat! Do clocks with calming, beach-scape sounds have you dreaming through your scheduled alarm? 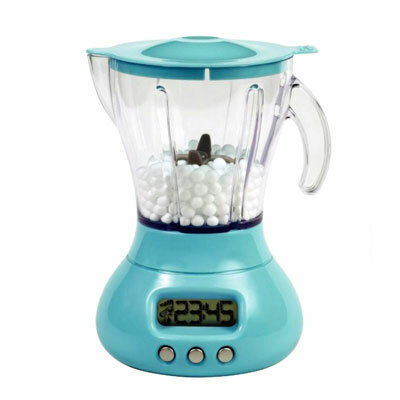 Ditch the vacation noise for a cacophony of churning Styrofoam and absurd jingles being played simultaneously by this retro-style blender ($75, bimbambanana.com). Nothing says “welcome to the real world” better than this. Gear up for those rapidly approaching finals with these gadgets that are sure to get you awake and ready to face the day. Good luck! All photos used are courtesy of health.com.